Background: Inflammatory bowel diseases (IBD), which include Crohn’s disease (CD) and ulcerative colitis (UC), are described as a chronic inflammation of the small intestine and colon, caused by a dysregulated immune response to host intestinal microbiota in genetically susceptible subjects. Objective: The aim of this study was to compare probiotic therapy versus placebo in Oxidative Stress Values and clinical features in patients affected by IBD. Method: Forty (40) patients previously diagnosed for IBD were recruited and randomized to receive probiotics (test group, n=20) or placebo (control group, n=20) administered for 90 days. Subjects in both the groups were assessed for overall oxidant ability (d-ROMs test) and for the antioxidant response (BAP test): data were reported at baseline, after 1 and 3 months. Additional data from anamnesis and haematological investigation were also reported during the study. Results: d-ROM assay clearly showed that the values observed in the test group were significantly improved, leading to oxidative stress values which are not pathological. The test group showed increasing BAP values, thus confirming the overall improvements of patients ‘health following administration of probiotics. Conclusion: Oral administration of the specific probiotics demonstrated its efficacy and safety on patients affected by IBD. 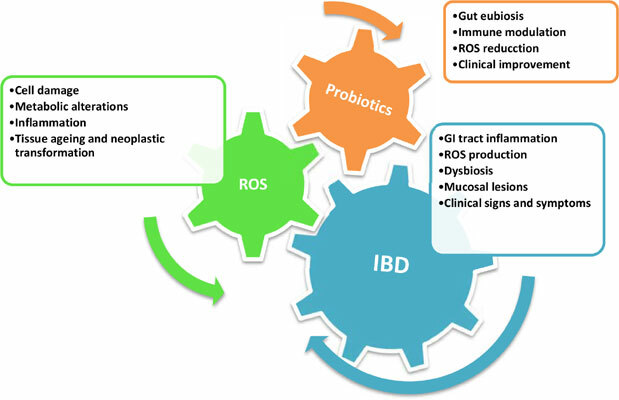 Probiotics, Inflammatory bowel disease (IBD), gut microbiota, Immune modulation, oxidative stress, reactive oxygen species (ROS).